ALLAHABAD: A school in Uttar Pradesh's Allahabad that apparently never allowed the singing of the national anthem deeming it "un-Islamic", has been shut down and its manager has been arrested after several teachers resigned over his refusal to allow the anthem this Independence Day. Zia-Ul Haq, the manager of the MA Convent School, has been arrested under a law against "Insults to National Honour". He has also been accused of running the school illegally. 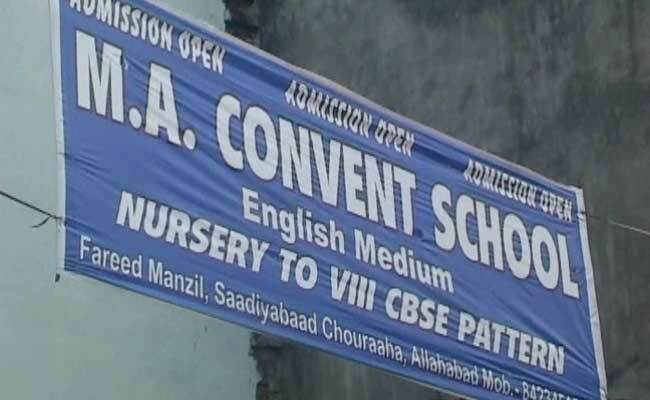 National anthem On Independence Day had been banned in Allahabad's MA Convent School for last 12 years. A senior district official, Andre Vamsi, said Mr Haq's statements had caused "tension in society" and police complaints had been filed against him. Mr Haq had told teachers that it is unacceptable for Muslim students to sing the wordsBharat Bhagya Vidhata - which he interpreted as "India is the lord of its people" - as only God is the lord. "Most of us have not been working here for a very long time. We were shocked to learn that the school has never allowed the singing of national anthem in the last 12 years," said Ritu Tripathi, the school's principal, who resigned yesterday along with seven teachers. "We were asked to fall in line or leave, so we chose a decision based on our conscience," she added. Before his arrest last night, Mr Haq had told NDTV that he had not allowed the anthem "keeping in mind the views of Muslim parents". "Muslims believe that the Almighty is the lord of everyone, including all Indians... Even the Supreme Court has said that a person is free to not sing the national anthem if any part of the anthem is against his or her religion," he said. State education officials say they are investigating how the school functioned for over a decade without proper permissions. "We had sent its management a notice to close the institution about a week ago. We are surprised to learn that the school is still running," said Jaikaran Yadav, an education official in Allahabad. The school has about 300 students from nursery to Class 8. Description: A school in Uttar Pradesh's Allahabad that apparently never allowed the singing of the national anthem deeming it "un-Islamic", has been shut down and its manager has been arrested after several teachers resigned over his refusal to allow the anthem this Independence Day. 0 Response to "UP School Bans National Anthem, Teachers Quit, Manager Arrested"